Re.Framing Activism under new management! We present online audiovisual documentation of much of the programme of the inaugural Opera and the Media of the Future event, which was held at Glyndebourne on October 24-25th, 2014. (The OMF project is directed by Evelyn Ficarra and Nick Till). Click here for the full set of links. 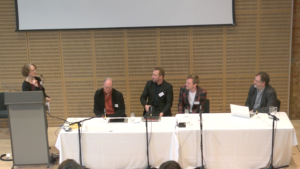 DAY ONE (Friday 24th October, 2014)focused on Opera Audiences, and featured talks and panel discussions on Opera Cinecasts, Current Audience Research, The Future Mediascape, and Audience Development, Education & Marketing. DAY TWO (Saturday the 25th of October 2014) focused on New Forms for Opera and featured sessions on New Media and Opera, Opera on Web and Mobile Platforms, and presentations about the OMF Mini Web Opera Commissions. We have just published a new essay at REFRAME‘s peer-reviewed publication SEQUENCE: Serial Studies in Media, Film: esteemed film scholar Pam Cook on Todd Haynes’ HBO television miniseries Mildred Pierce (2011). Cook’s essay (and video essays) forms the second instalment in SEQUENCE Two: We Need to Talk about the Maternal Melodrama, and follows on from Sue Thornham‘s inaugural discussion of Lynne Ramsay’s critical reappraisal of the maternal melodrama in We Need to Talk about Kevin (2011), which analysed in detail the film’s exploration of issues of female identity, agency and control. Cook’s article may be found here: http://reframe.sussex.ac.uk/sequence2/archive/sequence-2-2/. SEQUENCE is co-edited by Katherine Farrimond, Russell Glasson, and Catherine Grant. The latest entry at the lively Mediático website is by Mexican cinema specialist Dolores Tierney. In it, she critically assesses the latest ‘transnational’ film by Iñárritu, one of the directors whose work forms the focus of her latest book project: http://reframe.sussex.ac.uk/mediatico/2015/02/23/birdman-or-the-unexpected-virtue-of-ignorance-alejandro-gonzalez-inarritu-2014/. Mediático is co-edited by Juan Ramos, Dolores Tierney and Catherine Grant. Pending the creation of a bespoke website, a new REFRAME page has been set up to publicise and call for contributions to a new project from the Centre for Life History and Life Writing Research, in partnership with REFRAME. The outcome will be a new collection of life writing or audio/visual essays based on psychogeographical explorations of the town of Lewes and the area defined by Lewes District Council. More information about the project can be found here: http://reframe.sussex.ac.uk/reframe-projects/reframe-projects-and-publications/pol/. This project is directed by Margaretta Jolly, Lyn Thomas, and Adam Whitehall, and the publication will be co-edited by them and Catherine Grant for REFRAME. 5. Re.Framing Activism under new management! This very popular website was founded by Rachel Tavernor, with Marina Fuser, in 2013. After a short hiatus, the editorial reins have been very ably taken up by our colleagues Eleftheria Lekakis. A recent entry was published by Pollyanna Ruiz on her new book Articulating Dissent; Protest and the Public Sphere: http://reframe.sussex.ac.uk/activistmedia/2015/02/articulating-dissent-protest-and-the-public-sphere/. Marina Fuser has also recently contributed a consideration of the recent attack on the offices of Charlie Hebdo: http://reframe.sussex.ac.uk/activistmedia/2015/01/decolonizing-coexistence-beyond-hebdo/. If you’d like to contribute to any of the above publications, please email REFRAME. If you’d like to explore the range of REFRAME projects published to date. please visit this page: http://reframe.sussex.ac.uk/reframe-projects/. ← Previous Previous post: November Round Up: Web Operas, Media Activism, Psychogeography, Cinematic Melancholia and Optimism! Next → Next post: Presenting REFRAME Books!